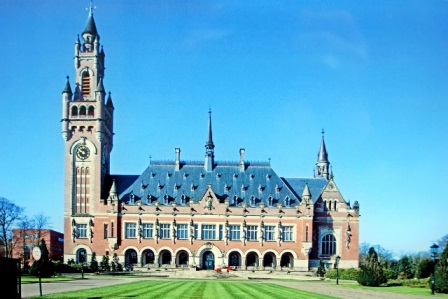 The International Court of Justice (ICJ), Hague, on 18 May 2017 stayed the death sentence given by a Pakistan military court to former Indian Navy officer Kulbhushan Jadhav, who was claimed to be a indian spy by Pakistan. It said Pakistan should ensure that no execution takes place until the final hearing by the court and that Pakistan shall inform the court of all measures taken in implementation of the final order. The final verdict is expected in August. "The court finds in favour of India's plea that no execution of Jadhav should be allowed until it has disposed the case" judge Ronny Abraham said. The 11 judges agreed with India that there was urgency in the case, and noted that Pakistan had given no assurance that Mr Jadhav would not be executed till its verdict. We will be explaining the Vienna Convention and its important Articles. The term "diplomatic immunity" refers to a principle of international law that limits the degree to which foreign government and international organization officials and employees are subject to the authority of police officers and judges in their country of assignment. Its objective is to allow foreign diplomats the freedom to carry out their legitimate official duties without interference, and does not amount to an open invitation to do whatever they please without fear of punishment. The basis of diplomatic immunity is expediency and reciprocity, not absolute license. A foreign diplomat (like a local citizen) can be charged for all offenses committed, whether big or small. The only difference is that he or she (upon verification of diplomatic identity) may not be arrested, held in legal custody, or made a defendant in a court case. Instead, he or she is deported through due process to his or her home country to face prosecution under its laws. Diplomats who are serious offenders or indulge in activities contrary to their official status may be declared “persona non grata” and be forced to go back within a few days or even hours. The concept of diplomatic immunity goes back to the ancient Indian practice of diplomacy and to Greek republics and Roman empires that enacted specific laws to protect diplomats. Modern international practice is rooted in the 1708 UK law that prohibited the arrest of foreign diplomats. Its provisions were expanded and formally guaranteed by the 1815 congress of Vienna, and were further amplified by the 1961 Vienna Convention On Diplomatic Relations. Similarly, the Vienna Convention on Consular Relations of 1963 was codified. The Vienna Convention on Diplomatic Relations (1961) is a treaty that defines the framework for the conduct of diplomatic relations between countries. There is also a separate convention on Consular Relations signed in 1963. These treaties were developed under the auspices of the United Nations. They apply not only to diplomats but to personnel from the military departments, both military and civilian, who are in the country under the authority of the Chief of Mission. Article 9: The host nation at any time and for any reason can declare a particular member of the diplomatic staff to be “persona non grata”. The sending state must recall this person within a reasonable period of time, or otherwise this person may lose their diplomatic immunity. Article 22: The premises of a diplomatic mission, such as an embassy, are inviolate and must not be entered by the host country except by permission of the head of the mission. Furthermore, the host country must protect the mission from intrusion or damage. The host country must never search the premises, nor seize its documents or property. Article 30 extends this provision to the private residence of the diplomats. Article 27: The host country must permit and protect free communication between the diplomats of the mission and their home country. A diplomatic bag must never be opened even on suspicion of abuse. A diplomatic courier must never be arrested or detained. Article 29: Diplomats must not be liable to any form of arrest or detention. They are immune from civil or criminal prosecution, though the sending country may waive this right under Article 32: Under Article 34, they are exempt from most taxes, and under Article 36 they are exempt from most customs duties. Article 31 1c: Actions not covered by diplomatic immunity: professional activity outside diplomat's official functions. Article 37: The family members of a diplomat that are living in the host country enjoy most of the same protections as the diplomats themselves. The Vienna Convention on Consular Relations of 1963 is an international treaty that defines a framework for consular relations between independent countries. The Vienna Convention consists of 79 articles, most of which provide for the operation of consulates; outline the functions of consular agents; and address the privileges and immunities granted to consular officials when posted to a foreign country. A few other articles specify consular officials’ duties when citizens of their country face difficulties in a foreign nation. Of particular interest for the right of individuals is article 36, providing for certain obligations for competent authorities in the case of an arrest or detention of a foreign national, in order to guarantee the inalienable right to counsel and due process through consular notification and effective access to consular protection. Article 5: Thirteen functions of a consul are listed, including protecting in the receiving state the interests of the sending state and its nationals, as well as developing the commercial, economic, cultural, and scientific relations between the two countries. Article 23: The host nation may at any time and for any reason declare a particular member of the consular staff to be “persona non grata”. The sending state must recall this person within a reasonable period of time, or otherwise this person may lose their consular immunity. Article 31: The host nation may not enter the consular premises, and must protect the premises from intrusion or damage. Article 35: Freedom of communication between the consul and their home country must be preserved. A consular bag must never be opened. A consular courier must never be detained. Article 36: Foreign nationals who are arrested or detained be given notice "without delay" of their right to have their embassy or consulate notified of that arrest. If the detained foreign national so requests, the police must fax that notice to the embassy or consulate, which can then check up on the person. The notice to the consulate can be as simple as a fax, giving the person's name, the place of arrest, and, if possible, something about the reason for the arrest or detention. The article 26 says that the receiving state must ensure to all members of the mission freedom of movement and travel in its territory. The article 27 point 4 says that the diplomatic bags may contain only diplomatic documents or articles intended for official use. But diplomatic bags cannot be controlled because they cannot be opened. Also personal bags of diplomatic agent are exempt from inspection unless there are serious grounds for presuming that it contains goods that are forbidden in the host country. The fees and charges levied by the mission in the course of its official duties shall be exempt from all dues and taxes (Article 28). Let us observe such immunities in greater detail. Consulates' administrative and technical staffs are not prohibited from engaging in commercial or professional activities outside their official functions. However, they enjoy immunity only for acts performed in connection with their official functions. Diplomatic immunity remains as essential now as it was when envoys were worried about being eaten by other tribes. Then and now emissaries need some form of protection in dealing with hostile states. However, Immunity has been buttressed by religion, sanctioned by custom and fortified by reciprocity. Over time practices have become precedents, courtesies have ossified into rights, and abuses have crept in as the number of internationally protected persons has skyrocketed. Diplomatic immunity is not intended to serve as a license for persons to flout the law and purposely avoid liability for their actions. The purpose of these privileges and immunities is not to benefit individuals but to ensure the efficient and effective performance of their official missions on behalf of their governments. It's time to restrict diplomatic immunity and to reduce the number of people who enjoy it and also dilute some of the specificity in the immunities. 1. We should get rid of the unwarranted and extensive privileges that have crept into the system. Extraterritoriality, which exempts diplomats from local laws in any situation, should be abandoned and privileges should be restricted only to what is essential to accomplish the mission. 2. Diplomatic immunities should no longer be extended to the personnel and representatives of international organizations and tribunals. On the other hand, diplomatic immunity too often does not protect representatives and embassies from attack by terrorists or complicit and barbaric governments. Governments must have the political will to protect foreign representatives in order to safeguard their own. An attack on one is an attack on all. Hence, a meticulous revamp of Vienna Conventions is long due in the Post Cold War world to reflect the contemporary realities.